Get started in professional 360 filmmaking using the Blackmagic Micro Cameras. 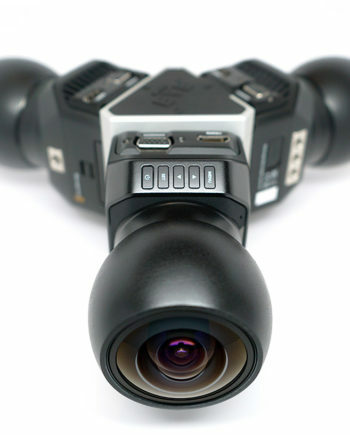 Now you can make your own professional 360 camera using the same cameras and lenses from our acclaimed Mini EYE™ range. If you can make your own rig frame this is the ideal beginner’s kit to start shooting professional 360 video. If preferred, you can buy our CNC rig frame. The Mini EYE™ Starter Kit includes Blackmagic cameras, our 360 Designs lenses, lens barrels, professional lens calibration and accessories. This exciting new product is intended to lower the barriers to entry for anyone looking to get started shooting 360 video with the Blackmagic micro cameras. It is a starter kit that is fully compatible with the rest of our Mini EYE™ range, and allows you to start with the basics, and add more equipment as you go. All you need to do is add your own rig frame (e.g. cheeseplate mounting system) to make your own 360 camera. This starter kit for professional 360 video includes the three Blackmagic micro cameras of your choice, all paired with our exclusive and acclaimed lens combination. This is the same professional lens combination and expert calibration included with Mini EYE™. Now you can get started shooting professional 360 on the Blackmagic’s more economically than before. This is ideal for system builders and those with the skills to make their own frame, while retaining the same 360 Designs quality as our Mini EYE™ rigs. If you prefer, you can buy an official Mini EYE™ rig frame, and add our J-Box, Professional genlock kit and other accessories. You can always add more components later, eventually building a complete Mini EYE™ rig. This lets you get started with professional 360 video, and add less critical equipment as your needs (funds, and clients) allow. We also include our expert professional lens calibration which is essential to pair each lens to each camera (why this is important). With this calibration you should never need to calibrate the lenses again. With this kit you are 90% of the way to having a true professional 360 camera, with a bundle of upgrade options and paths. IMPORTANT NOTE: Purchasing the Mini EYE™ Starter Kit requires the customer to protect details regarding our lens combination from third parties and public disclosure. The cameras may not be used or photos shared in public without the lens barrels fitted. This policy protects us and our customers who invest in this product, and is a non-negotiable condition of sale. We have a regularly updated FAQ that answers 90% of the questions we have been asked recently. This includes a section on how to decide between the Micro Cinema Camera and Micro Studio Camera 4k. New demo footage (Oct 2016) can now be downloaded from our Dropbox folder or viewed on our demo page.